Put the beans into a roomy pot with the bunch of herbs, 1.5 litres of cold water, the pepper, and salt to taste. Bring to the boil, add the lovage or celery, leeks, carrots and potatoes, and bring back to the boil. Bubble for 10 minutes, then stir in the peas or beans, and chard or pak choi. Return to the boil, reduce the heat and simmer for 5-10 minutes, until all the vegetables are tender. Meanwhile, make the pistou by blending all the ingredients to a purée in a food processor. Add the peppery greens to the soup, return the broth to the boil, stir in the pistou and bubble up for a moment to allow the oil and the broth to form a light emulsion. If this doesn't happen first time, drop the heat and bubble up again. Check the seasoning. 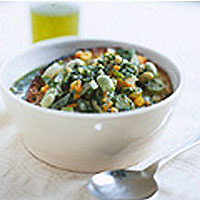 Remove the bunch of herbs, and ladle into bowls, with or without a slice of country bread in the bottom. Hand extra olive oil separately to drizzle over the soup.